Operations director Richard Tarran has a proven track record as a bar, restaurant and nightclub operator, trainer, area manager and IT specialist. Living Rooms, Mosquito, Deep Pan Pizza, Via Vita, Chiquito and Bass Taverns all feature on his very busy CV. 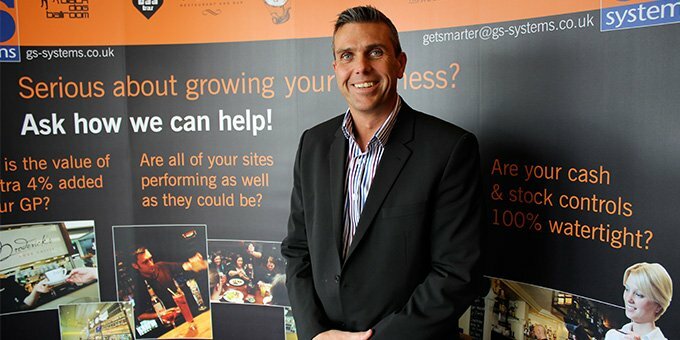 He first worked with GS Systems at Living Ventures, where he was responsible for setting up systems for new openings, supporting managers with stock control, budgeting and forecasting and successfully implementing EPOS, CMS and chip’n’pin solutions in 40 restaurants. What are your job responsibilities? I am the operations director responsible for making sure we deliver quality customer service at every stage of the client relationship. Whether it’s initial discussions with a prospect, ensuring the correct procedures are in place for existing customers or offering managed service support to growing businesses, it’s very much a hands on role to make sure our EPOS solutions are truly effective. What is your previous experience? I’ve over 20 years running restaurants and bars as a general manager, cluster manager, chef, implementing systems and training staff for some of the best known names in the business. I’ve been involved with successful, profitable and growing businesses and can share my experiences and knowledge. For example, the launch of one concept saw us exceed our 12 month net profit target by £100,000 within six months and earn a 72% gross profit on liquor. I helped another concept boost profits by 13% within two years of refurbishing a two-dozen outlet chain. All this accumulated know-how is now readily accessible to all our clients. What attributes are essential to do your job? Always listen to the challenge facing the client – and make sure you’re organised and have the right procedures in place. I’ve seen first hand the benefits of airtight controls and will always champion them with existing and new clients. You need airtight controls. Without them you’re vulnerable. You constantly want to be controlling your stock, your sales, your cash and staff costs if you want a business that can develop and mature. That philosophy was embedded in my psyche from the day I entered the industry. Coming from Yorkshire helps. I am 100% into the concept of watching the pennies. Do that and the pounds look after themselves. What are the biggest challenges in your job? No two customers are ever the same so it’s tailoring solutions to their specific needs and adding value to their proposition. Where have you added value to clients? Daily hopefully. What are your most enjoyable work experiences? Seeing businesses grow thanks to our input. What is your best tip to help a clients’ business grow? Never make a decision to buy EPOS purely on price. It is a false economy. You are buying the hardware AND making an investment in a long term relationship. It’s a great journey and education but you need to be accompanied by like-minded spirits. Why do you like your hobbies? I enjoy the social side, relaxing with friends whilst also keeping myself fit. I also like to win, especially on the golf course. Favourite film? None that spring to mind. There’s not many films I’d see twice. Favourite song? The one that is currently buzzing around my head – although that changes by the day. Favourite book? Anything that helps me drop my handicap. Favourite drink? Jack Daniels and coke, plenty of ice please. Most memorable day? When my boys were born.